Carefree, exercising their new limbs in short bursts of energy then dipping for a nip of milk from their mother–these are calves at play. Sometimes I don’t feel much like a calf at play and my spirit has no energy to expend, even in short bursts. The warm rays of healing that would indicate victory in my life haven’t touched my skin. 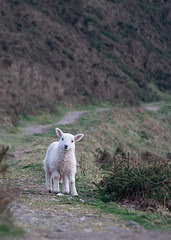 I feel more like a lamb, alone, repeatedly bleating, lost from the rest of the herd with no source of comfort. But in my flailing about for relief I will miss the promised victory, the sun and jumping calves. In the midst of whatever may be happening God calls me to honor his name. The word but makes all the difference because in this last book of the Old Testament God says the day is coming when the arrogant and evildoers will be destroyed, but, if I honor his name, thankful for what he has given me, rejoicing that he is with me, I will not be among them. Victory will come in due time. The sun will shine again and I will leap with joy when I walk out of the darkness into the healing rays of the sun. But, first comes honoring his name and this comes about by how I walk through my life and live in the present, day to day. So today, giving honor to his name must be my focus. Calf jumping will come later and no doubt when I least expect it. Jesus, your presence is what will keep me going today.